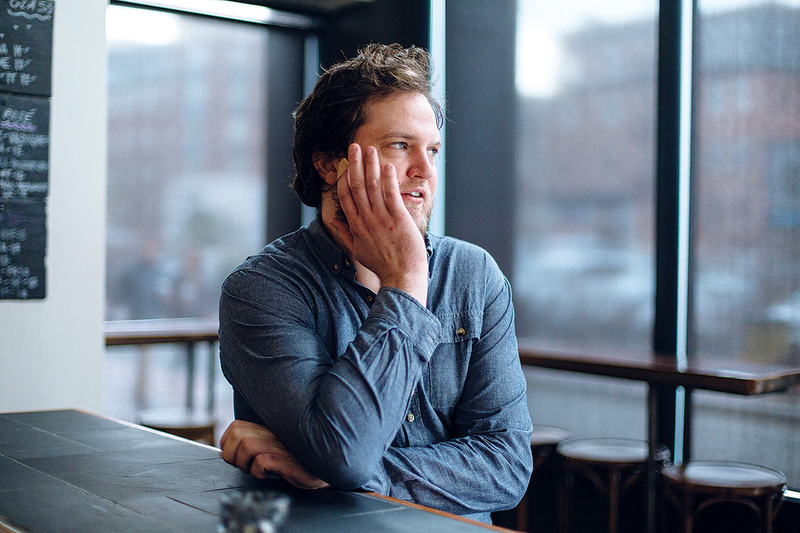 Benjamin Sukle has spent nearly a decade perfecting his culinary craft in Rhode Island. After graduating from Johnson & Wales University with a B.A. 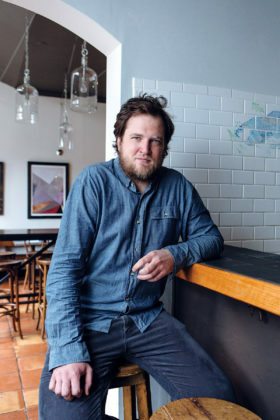 in culinary arts in 2008, he worked at various restaurants in Providence before branching out on his own in 2013 with birch, an 18-seat venue serving modern American dishes inspired by Rhode Island ingredients and culture. Oberlin, Sukle’s second restaurant, serving local by-catch seafood (fish caught as a result of trawling for more commercially desirable species) with curated wine selections, was No. 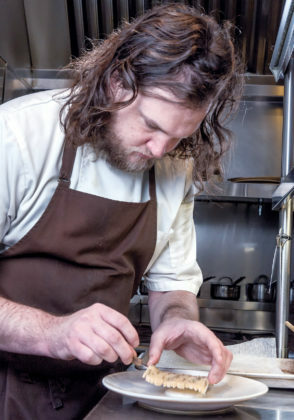 7 on the 2016 bon appétit magazine list of America’s 10 Best New ­Restaurants. What is your first food memory? My mom’s mac and cheese, the casserole style [with breadcrumbs]. Are there foods you don’t like? Green peppers and raspberries are disgusting, the little seeds get in your teeth. That’s very specific, but those always make me cringe. What are your expectations for your customers’ palates? It’s gotten to the point where I know what’s tasty and I’m not trying to make people try things they don’t want. I trust my palate and I’m not going to say, “You’re going to try something really weird and you’re going to like it because I’m a chef.” That’s not what I do. How would you describe the missions of your restaurants? I see voids that need filling. There wasn’t anything, fine diningwise, opening up in Providence for a long time, but I knew, as far as my generation, fine dining meant something completely different [compared] to the generation before [which sees it as] white tablecloths, a big to-do. At birch, it’s much more stripped-down but the food is – not intellectual, I hate using that word – you read the menu and you don’t know what you’re necessarily going to get. I take myself out of the equation. I’m not trying to make you think I’m an artist. … This is just the way I came up with a delicious way to represent this product. With Oberlin, we do a lot of detailed sourcing for all of the ingredients. You can’t get slices of local raw fish around here … [and] there’s not a lot of places you can get several kinds of pastas that aren’t a pound and a half and meant to be your whole dinner. What I always like is for somebody to get some slices of fish, a pasta and some really good wine. That’s pretty chill and that’s a void I think needed to be filled. Hitting that middle ground, are you ever worried customers aren’t going to be intrigued to come in or return? I’m worried about everything. [Hitting the middle ground] is more of a shotgun approach than a rifle, you just hope all the pieces land where they should. What I consider fine dining, in another generation, is not going to be relevant anymore. What I want is to be able to know when that happens and change with it. Ultimately, if it’s delicious, people are going to want to eat it again. Good food and good hospitality is the simplest combination, but it’s the hardest thing to do every day. LOCAL FOCUS: Benjamin Sukle, owner and chef of Providence-based restaurants Oberlin and birch, plates one of his dishes. Sukle says birch focuses on getting ingredients from Rhode Island and New England, especially in the winter months, whereas Oberlin “is a celebration of using everything in bulk,” including a farmer’s excess produce. You talk about balancing good food and good hospitality – that’s pretty much you and your wife, Heidi, ­respectively, right? Yes. Heidi has a lot to do with the front of house at birch, she is the general manager. I always say hospitality is more important than food. How difficult is it to work and live with your spouse? It’s not difficult, it’s exhausting – in the sense that there’s never an on or off switch. It’s not like we go home and just turn off work and turn on being a couple. Mentally, do you and Heidi ever get to leave the restaurant? No (chuckles). How many working hours versus off hours do you have per week? Yesterday, we took the spring furniture out of the basement, but then it was right back to it. Our days off are Tuesdays and Wednesdays and everyone else works those days, so we’re getting emails. … It doesn’t ever end. You’re a Pennsylvania native and graduated from JWU. Why did you decide to stay in Providence to open your restaurants? I became a sous chef at a restaurant while I was [in school] and it was a job I liked, so Heidi moved and we bought a house soon after I graduated. I wasn’t willing to start over, especially because now I’m going on about 10 or 11 full years of working in this state. At the time, it had been five or six years and there were really good people and really good product, so I [didn’t want to leave]. It made sense. A 2016 Zagat report named Providence a top U.S. food city. Is eating out part of the local culture in Providence? It’s almost expected that a city with a culinary school [will have good restaurants], so it’s almost as if we’re trying to live up to that. 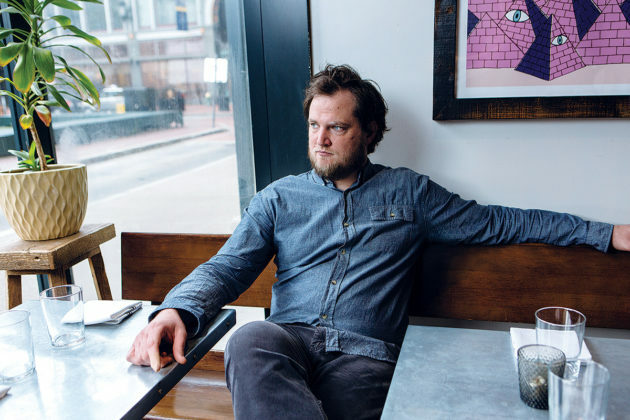 … But, I think that’s always part of the culture in any midmajor to major city, which is ultimately part of a restaurant’s downfall when it comes to staffing, because once there are a lot of restaurants, there are a lot of jobs that need to be filled. Are you having trouble finding staff? Always. I won’t say it’s trouble because … it’s a problem we caused. The guys at New Rivers and Chez Pascal probably thought when I opened [I was the problem]. JWU is right down the block, do you feel like a constant ambassador or example? Yes and no, the curriculum is always changing at JWU. It’s being geared towards a more financially and socially sound lifestyle because no one wants to work the hours I work anymore – which I get. They’re always there when I need them and I try to help out. But, it’s very rare that I can put my head above water and take a look around, especially because none of my restaurants is 5 years old yet – they’re still very much babies. How much of a role do you see for yourself in building the city’s food reputation? None because, at the moment, I’m only focusing on what’s happening inside these walls. I’m in the wrong field to be thinking that way. We’re focusing on the people that are [dining] here now and making sure they tell their friends this is a good place. If it gets to the point where I can step back, I’m all for it; but right now, it’s like these two little spots are my world. What are the challenges of cooking in Rhode Island, a tourist destination where some feel pressured to stay middle of the road? I don’t know if we get a lot of tourists, to be honest. … We do a better job in terms of focusing on hospitality and making sure that we recognize people who have been here before, people who are willing to return multiple times and making sure they feel welcome. What’s been integral to our success is that The Dean Hotel opened the same time birch did – which made downtown [Providence] a place to come and hang out. … [Prior] it was a place where you have dinner and go away. We were fully expecting that [first] summer to be an absolute drag, but what happened was people going to Maine from New York were stopping in Providence because of the cool hotel [and they recommended birch as a place to eat]. How do you balance the need for monetary success with satisfying your creative passion? Heidi takes all the codes and passwords for the bank accounts away so I don’t see them. In between those two is trusting yourself. 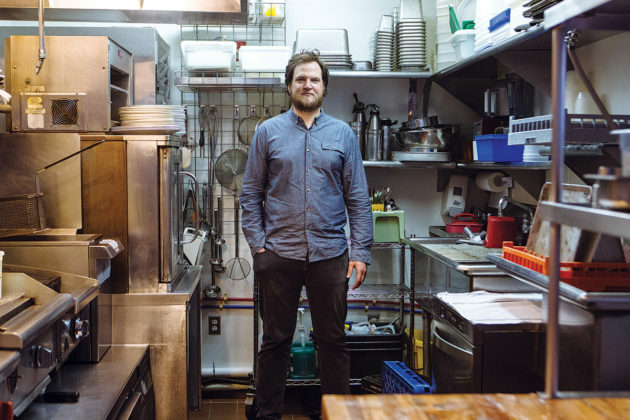 If I had opened a restaurant three years before birch, it would have gone out of business because I was much more, “I’m a chef and I’m going to do something you’ve never seen before.” … We were fortunate there were no spaces available [at that time]. You have to genuinely hear what your guests are saying. If you don’t listen to the people, what’s the point of opening a restaurant – [which is] a public forum. … Nobody is the same, so you have to trust yourself and be willing to accept the fact that your palate is really gross to other people. Do you feel you can be both a commercial success and a creative chef in Rhode Island more than anywhere else? I wouldn’t know; I’ve only ever opened a restaurant in Providence. I’m still trying to figure that out; I’m wading through those waters and trying to float my way through it. You’re from central Pennsylvania, could you have opened there? No, not at all. Or I would have to word my menus way differently. People want pound-and-a-half portions of pasta there [and] I don’t feel right doing that. But I don’t think they’re dumb for wanting that. Imagine how dumb it would have been if I had gone and done this there knowing that. That’s how you balance creative success and actual success. You go out and serve customers sometimes. Why? I think it’s fun. … there’s a connection there rather than just putting down a plate of food. … It’s what I see as fine dining: blowing down a barrier. There’s no difference between front of house and back of house, in that we’re all here for hospitality and just cooking is not hospitality. How much of what you cook is driven by being based in Rhode Island? All of it. Birch focuses much more on getting [ingredients] from Rhode Island. … In the winter months, we focus on Rhode Island but end up going to Massachusetts, Vermont and New England. Whereas Oberlin is a celebration of using everything in bulk. We’ll use up a farmer’s [excess produce]. When you’re experimenting on innovative ideas to move your menus forward, which side of your brain – the creative end or the business end – speaks the loudest? It’s more the creative side and the doubting side. I have much more of a doubting side to my brain than anything. A documentary I watched showed a New Yorker cartoonist … the guy they call when something falls through, whose [covers] end up being some of the most memorable. In the interview, he said [editors] think [a cover] is the greatest thing and then want another one. He said he felt he won the lottery and they wanted him to win it again. That struck me. I had this great idea and I’m exhausted now, but I have to do it again and again and again. The more you fail, the more you learn about yourself. Do you enjoy balancing the books? Is that something you’re involved in and did you receive training for restaurant management? That’s Heidi. Anytime I sit in front of a computer, I fall asleep. … We went to some of the Small Business Administration classes, but a lot of it was us getting a very good accountant … [and] once a week we have a woman enter everything into QuickBooks because we don’t have time. How challenging is it, personally and professionally, to run two successful restaurants, one of which has national acclaim? The bon appétit award blew us out of the water. It was insane and made things way harder. It sounds dumb, but it’s crazy how much being insanely busy is hard work. I’ve never experienced that before. It was extremely difficult. [But] Rhode Islanders don’t really care [about] a lot of these [awards]. It’s not something they look for. It helps for when your friend from the U.K. is coming over and reads about what’s going on here … but when you’re living here, you go where you feel like [eating]. Does the size of a restaurant determine the chef’s ability to experiment in his or her cooking? For sure. The larger the restaurant, the more you have to pare down what you think people want. Is something fine dining going to work in a 100-seat restaurant? No. Is fried chicken? Yes. It’s simple things like that. What is the ideal restaurant size and why? I like ones where I can be involved constantly. If you have 150 seats, you’re not going to be able to see the day-to-day operations. hing that should be recognized. Was national recognition a goal for you? It’s not a goal, but you know those people are around and will come and judge your restaurant. It’s fun to [win]. … You get to see new parts of the world and country, but you don’t get that without the mindset of hard work first. Have you hit your stride or are you still working to prove yourself? No, still working. … When people want to work here, are proud of what they do and don’t feel like a cog but an integral part … that’s me hitting my stride.